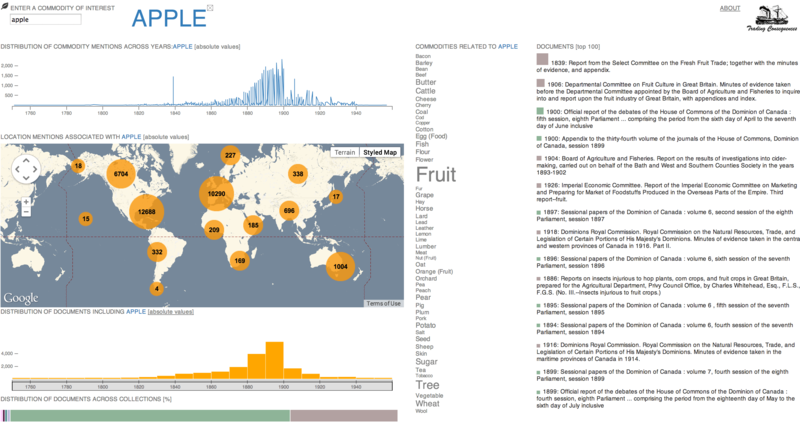 For the past two years, the “Trading Consequences” team has been hard at work exploring how to get computers to read to historical sources and to visualise the results in ways that encourage historical inquiry. Colin Coates and Jim Clifford worked with computational linguists at the University of Edinburgh (Prof. Ewan Klein, Claire Grover and Beatrice Alexander, Clare Llewellyn), computer scientists at the University of St Andrew’s (Prof. Aaron Quigley, Uta Kinrichs), and the team at EDINA (Nicola Osborne, James Reid, Ian Fieldhouse). From our historians’ perspective, we wanted to explore the vast amounts of digitised texts from the nineteenth century to reveal the scope and consequences of commodity trade. This is all very familiar to Canadian historians, given the emphasis in our economic history on the staple trades. For the formal and informal British empire of the nineteenth century, fortunes were built on natural resources, and local populations often experienced devastating consequences. A number of important and fascinating works on specific commodities, such as Stuart McCook’s work on coffee (McCook, 2006) or John Soluri’s study of the trade in bananas (Soluri, 2005), have revealed the complex economic and environmental impacts a single product may have. “Trading Consequences” has created a website interface for all interested researchers to explore. There are many functionalities in the interface that allow researchers to examine different aspects of resource trades. As a quick example, the “Trading Consequences” website literally allows us to compare apples and oranges. This test case shows some of the possibilities that researchers may be able to identify by using this database, as well as some of the pitfalls that we historians know exist in all types of historical research. Both apples and oranges became the objects of substantial international trade in the nineteenth century, as in the right conditions they can remain edible despite being shipped great distances. They are complementary fruits in many ways, as apples are grown in temperate climates whilst oranges prefer warmer conditions. They may overlap geographically, but typically we associate different parts of the world with each fruit. In the context of the British world, apples grew in the United Kingdom, of course, but they also came from Canada, New Zealand and the United States, among other locations. Oranges from places like Spain, Florida or Latin America entered the United Kingdom in the nineteenth century. 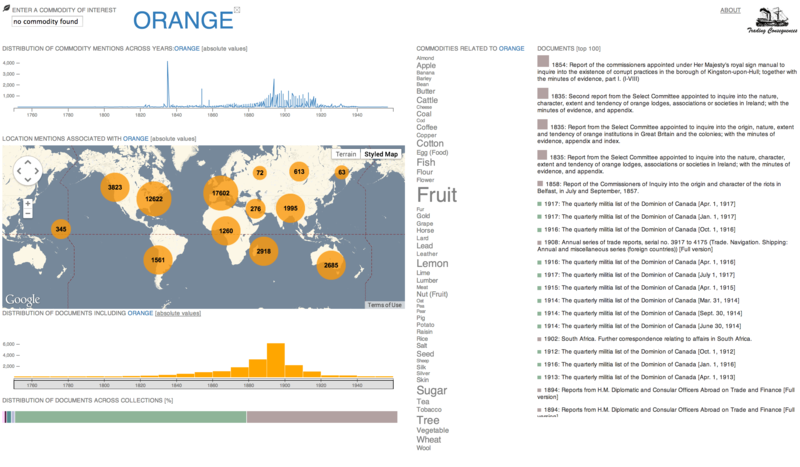 The two maps which result from entering “apple” and “orange” into the database show, at a glance, how oranges appeared more often in reference to warmer zones than apples. 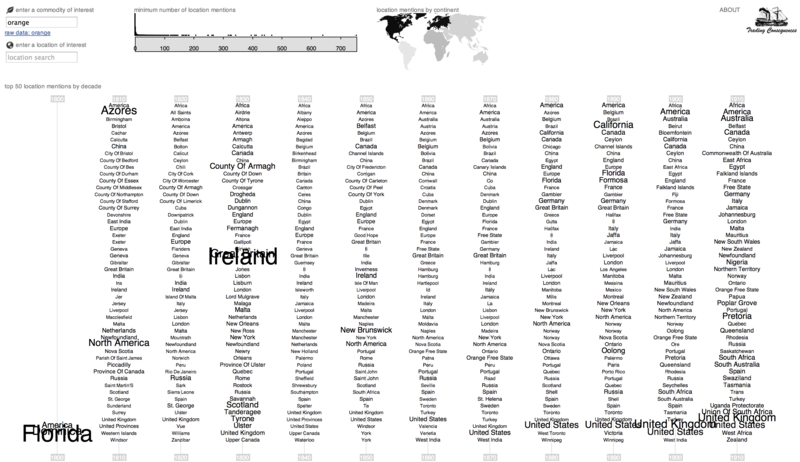 The “Trading Consequences” visualisations show some instructive comparisons, some that may point to different ways to conceive of trade in these resources, and others which illustrate the care with which researchers should approach results. The interface is available at http://tradingconsequences.blogs.edina.ac.uk/access-the-data/. Colin Coates and Jim Clifford welcome your feedback about the site – we hope that a wide range of researchers will use it. Stuart McCook, “Global rust belt: Hemileia vastatrix and the ecological integration of world coffee production since 1850.” Journal of Global History 1, no. 02 (2006): 177-195. John Soluri, Banana Cultures: Agriculture, Consumption, and Environmental Change in Honduras and the United States. (Austin: University of Texas Press, 2005). the consequences are clearly stated in this blog. thanks a lot for sharing such a informative piece.